I have received the following e-mail in my inbox. I am pleased to inform you that your proposal Hood 2.0 – it’s a Web 2.0 World out there, has been accepted for presentation at ALT-C 2008. The workshop will examine the concept of Web 2.0 services in addressing the tensions between formal and informal learning, and empowering learners to take responsibility for their own learning. It will demonstrate and allow participants to discuss and debate different learning scenarios and activities which utilise Web 2.0 services. Web 2.0 services will be used to demonstrate these scenarios. The Chair of Mozilla, Mitchell Baker, has made a plea to developers to harness the creativity of the internet and apply it on mobile phones. Developers are being asked to devise applications for mobile devices so users can “access it, mix it up, save it, and store it”. The plea to harness the creativity of the internet and apply it on mobile phones was made by Mitchell Baker the chair of Firefox developer Mozilla. All of this functionality “should be the same if I am on a laptop or phone, at home or on a train,” says Ms Baker. “The breadth of the new ideas floating around and the different ways that people are thinking about information and using the web further away from browsing into more personalised information is exciting,” said Ms Baker. This is an interesting report on how we could be using mobile devices and of course a lot of these ideas are transferable to mobile learning. The fact that phones know where they are (even without GPS they have a rough idea) adds a dimension to mobile learning that the traditional (dumb) PDA could never have. Having said that we will see more devices with GPS chips as they get smaller, cheaper and use less power. If you are like me you depend on your mobile phone. Actually if you are like you depend on your mobile phone and 3G dongle for data. I actually rarely use my mobile phone for actual phone calls, for me mobile data is what I use all the time. I use mobile data to Shozu my photographs from my phone to Flickr. I use mobile data to update my Jaiku feed and use SMS to update Twitter. I (now and again) browse the internet on the web browser on my phone – usually t find out if my train is delayed or cancelled or for traffic reports. I use mobile data to allow me to stream live video from my phone via Qik.com to other locations. If you are like me you depend on your mobile phone for mobile data, or you might just use the phone for phone calls! Anyhow I was interested to read on the BBC website about a new technology which will make it easier to get a better signal. The signal strengths of laptops and mobile phones are set to be radically improved if new technology developed by Oxford scientists comes to fruition. Engineers at Isis, a technology transfer spin-out company of the University of Oxford, have found a way of creating antennas which can work in three “planes” but that are small enough to fit in hand-held devices. Now if you are making a phone call and the signal strength drops, what you notice is a reduction in the quality of the call. However with mobile data, if the signal strength drops, you find that internet access crawls and often you are faced with timeouts. You can replicate this by using 3G in a moving vehicle such as a train or a car. If the signal strength can be increased this means that you can have greater reliability in using mobile data then you can now, which means you would be able to rely on it working rather than hoping it would work. An interesting article by Internet law professor Michael Geiston the BBC News website on how museums are embracing digitisation and the internet but at what cost. As museums experiment with the internet – many are using online video, social networks, and interactive multimedia to create next-generation museums that pull content from diverse places to create “virtual museums” – the museum community has emerged as a leading voice for the development of legal frameworks that provide sufficient flexibility to facilitate digitisation and avoid restrictions that could hamper cultural innovation. The more we can freely and easily use out of copyright digitised material for learning, the more enhanced and enriched learning can be. Rather than rely on just the interpretation of a resource, we can use the resource as well. For example when I was at school, we relied on text books to inform us about what happened in history. Today using a range of resources, alongside that book we can also read the newspapers of the day, the parliamentary papers and so much more. All from the comfort of our classroom, or from a learners’ perspective from the comfort of where they want to be, whether that be their home or in a coffee shop. I am pleased to hear that museums are digitising their collections as it can only widen access to the general public including learners across the country. In the US? The Kindle back in stock. Reading on Engadget I see that Amazon’s Kindle is back in stock. Today I travelled across the country to Oaklands College for the informal ILT Champions conference which was set up by Peter Trethewey. I was presenting on micro-blogging and we looked at Jaiku, Twitter and Flickr. We didn’t have a huge amount of time, but I feel we had a good discussion, even if we did go down a few ratholes. In the afternoon in an open session I led, we discussed spaces, web 2.0 and aspects of Keynote. I attended a very good PowerPoint session led by Dave Foord in which he covered the “magic” of PowerPoint. He made the very valid point that as a lot of staff are familiar with PowerPoint using it to improve the interactivity and engagement of learner, and this is probably a better option than trying to do similar things with new or different software. I also said I would link to his interactive heart PowerPoint presentation. Earlier in the day, Richard Everett gave an illuminating overview on how Oaklands College were moving forward the college in the utilisation of e-learning. One thing I like about Richard’s approach is that he focuses on the pedagogy and the learning, and using technology to support that process. With him, it is never just about the technology. I enjoyed Ellen’s session on speech to text and text to speech technologies, her demonstration really showed the value of this software for learners. Rob Englebright’s session on VLEs led to a really good discussion on how local colleges need to interact and engage with the LEA in their area and the LEA needs to do likewise. Overall it was a really good day and a good idea. Thanks to all that helped to organise and run the event. Hopefully there will be another day like it at another college. 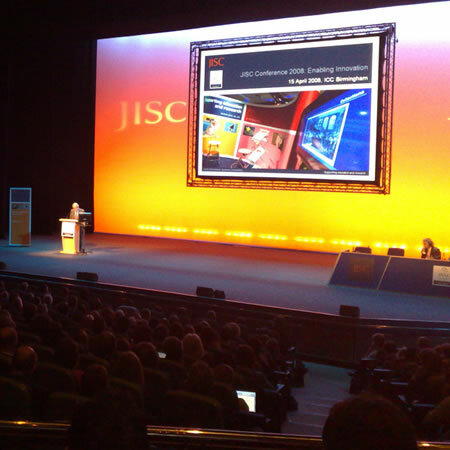 Today I am at the JISC Conference in Birmingham. This is the annual JISC bash where JISC talks up what they have done over the previous year, where they have been and where they intend to go. Unlike a lot of conferences where there are calls for papers and workshops, this doesn’t happen at the JISC conference. It is in the main JISC talking about JISC. I can’t remember what I signed up for in terms of presentations, but I suspect that there will be a lot of talk and a lot less interaction and engagement. The main reason I go to the JISC Conference is that it is a great opportunity to network and meet fellow e-learning people from across the country. I am pretty sure that’s why a lot of people go there too. You are currently browsing the e-Learning Stuff blog archives for April, 2008.